I found this a while back. As found on xkcd. They have great comics over there (especially if you’re a programmer, mathematician or physicist. 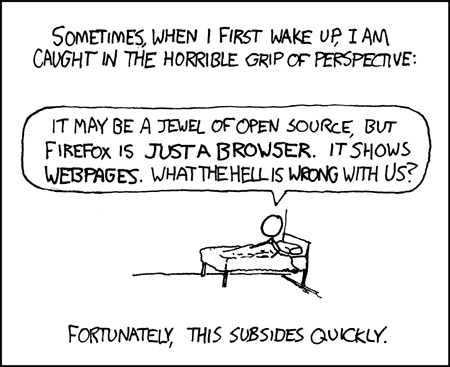 Seriously, a few years back all a browser could do was load pages, and that was all there’s to it. Nowadays some have fancy do-dads and others don’t. So what? That doesn’t make one browser better than the other. Thanks for the xkcd site! chrome is faster, though. that’s your big priority i would think.